It was the morning of our second school day at Laurea, and the coffee line was long. We sat in the cafe with a classmate and watched the line getting longer and longer. In a few minutes, we had come up with a solution to improve the situation. Or so we thought. 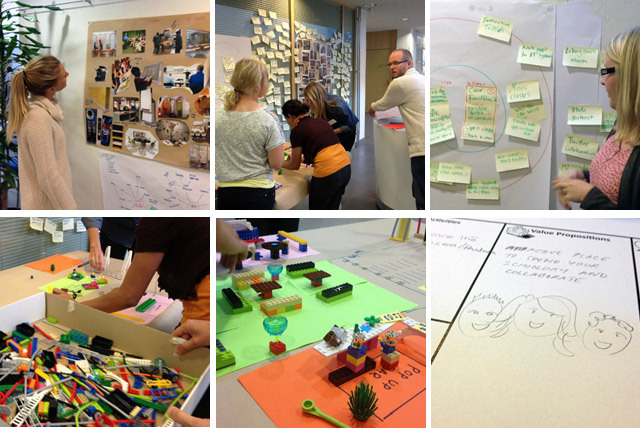 When our first Design Thinking class started and we got our assignment, we were thrilled. We were supposed to think how to make Laurea a better place to study, which meant we would have the chance to put our coffee line solution into practice on the spot. Oh. Right. A step back. When we finalized our task the next day, the coffee line problem was solved. But so were many, many other things that actually affect the atmosphere on the campus even more. To me, the most valuable lesson of the Design Thinking course was just that: take a step back, look at the big picture first. That’s how you can innovate something, not just improve existing solutions. And innovation is what Design Thinking is all about. Our workshop facilitator and the author of the article Design Thinking as an effective Toolkit for Innovation Katja Tschimmel describes Design Thinking as an abductive thinking, which is “thinking in new and different perspectives and about future possibilities, which do not fit into existing models”. This requires some perceptive cognition. In other words, taking a step back. A move backwards can open up totally new markets. As Tim Brown’s example in his article Design Thinking in Harvard Business Review showed, true growth may not lie where you think it would. The collaboration between the bike manufacturer Shimano and Design and Innovation Consulting Firm IDEO led to not following the original task but to taking a step back and reflecting the true reasons people act the way they do. The result of this action was a new business opportunity but also a new biking culture. These kind of examples show that design has become too important to be left to designers, as Tim Brown states. In his book Change by Design he claims that we all need to think like designers if we want to deal with the huge changes the world is going through right now. Traditional methods such as surveys and focus groups don’t usually generate ideas that are actually innovative, even though they might give a lot of insight to improve existing conditions. Everybody is familiar with Henry Ford‘s remark that, if asked, people would say they wanted faster horses. Today, people might claim they want faster cars or eco-friendlier motors. But by taking a step back and finding out how people would actually want to travel and why they do so in the first place, we might actually find solutions that are truly innovative. Waiting eagerly for someone to come up with a reliable flying carpet innovation (luckily, work is on progress) or, even better, a teleportation system! ← What does social activism mean in service design context? I also got this point! As a normal customer, we usually go to solution directly, but from now on, we are trying to be the designers with “design thinking”. =) A step back is the first step. We always run into the first or second familiar solution or thought we have, since we have it wired as a pattern in our minds. I agree that we should do this step backward to “understand” and not run into “familiar” solutions.